One hundred days is too early for definitive pronouncements, but five common themes have emerged in President Trump’s approach to the Middle East. President Trump has sought to repair relations with Sunni Arab leaders, who have been cautiously encouraged by his initial approach.12 In contrast to his self-image as a hard-nosed dealmaker and to his treatment of allies such as Germany, Trump has offered reassurance to regional partners without receiving much in return or pressing these rulers to take tangible steps to address domestic and regional drivers of instability.13 This represents a missed opportunity to drive a hard bargain in service of long-term U.S. interests. So far, President Trump and his team have shown a troubling lack of interest in the nonmilitary tools needed to advance America’s interests in a chaotic region—just when those tools are needed most in places such as Iraq to lock in progress on the battlefield. Trump has slow-walked the naming of a leadership team at the State Department and proposed a 30 percent cut in the State Department’s budget, which would include devastating reductions in diplomatic personnel, U.S. assistance, and funding for international organizations and other entities that support America’s goals in the region and lessen its burden.25 Demoralized, understaffed, and likely soon-to-be underfunded, America’s national security workforce faces a morale crisis that could result in an exodus of talent and a hollowing out of capacity and institutional memory from which it would take decades to recover. The following offers a closer issue-by-issue look at President Trump’s policies in the region. Trump promised the American people a new strategy for defeating the Islamic State—also known as ISIS—in the first 30 days of his administration. None has surfaced. Instead, the Trump administration has largely continued President Obama’s military strategy in Iraq and seems poised also to follow the previous administration’s plan to retake Raqqa working with Syrian Kurds.26 The administration has escalated direct U.S. military action. Diplomatic, political, and economic efforts needed for long-term stabilization post-Islamic State remain ill-defined and in need of greater investment. As significant progress is made against the Islamic State in Iraq and Syria, the Trump administration will need to define the next phase of the campaign and sustain the anti-Islamic State coalition to deal with Islamic State affiliates elsewhere, the return of foreign fighters, or the inevitable shift to greater dependence on expeditionary terror operations against U.S. allies and partners in the region, Europe, and elsewhere. Missile strikes could prevent further Syrian regime chemical attacks without escalation. But no plan is evident to link the use of force to a strategy to end Syria’s war.27 Trump is learning the limits of Assad and Russian President Vladimir Putin as counterterrorism partners given their radicalizing brutality.28 Having used force on behalf of the Syrian people, it remains morally indefensible that America should keep its doors shut to Syrians fleeing violence. In Syria, a sustained strategy to deliver peace and stability—not one-off missile strikes—should be the measure of presidential leadership. Although the Trump administration put Iran “on notice,” it remains unclear how it plans to make good on its pledge to address Iran’s destabilizing regional policies without sowing further conflict and instability.32 Despite calling the nuclear deal with Iran “terrible,” the administration has prudently kept it in place, promised vigorous implementation, and even certified Iran’s compliance.33 As it seeks out venues to escalate pressure against Iran, it is not clear that the administration has prepared for potential retaliation from Iranian proxies elsewhere in the region—for example, against U.S. troops stationed in Iraq—nor has it asked Gulf partners to take difficult steps in divided societies to shore up institutions that would reduce vulnerabilities to Iranian revolution. It should do both. President Trump has offered Gulf leaders support for their campaign and ramped up U.S. military operations in Yemen, dropping more bombs in a single week than President Obama did in all of last year.34 Further escalation against Iranian-backed Houthi forces is reportedly under consideration.35 Serious questions remain as to whether an expanding U.S. mission can help check Iran’s influence, much less end Yemen’s civil war and assist in addressing humanitarian emergency.36 Absent good answers, the administration should not deepen its involvement. After initial hints at a radical departure, President Trump’s evolving approach has veered in the direction of his predecessors.37 Trump has reaffirmed his desire for a negotiated peace, sent an envoy to meet with Israelis and Palestinians, urged Israeli restraint on settlements, sought Arab partners to sweeten the deal, and backed off campaign pledges to move the U.S. Embassy from Tel Aviv to Jerusalem.38 If Trump invests the political capital to persuade Israel to cooperate, many steps are also available to create economic opportunity in Palestinian territories. Warm initial meetings with Arab Gulf partners make clear the desire on both sides to achieve closer ties.39 Significant common ground exists given mutual mistrust under President Obama and President Trump’s closer alignment on Iran, Islamists, and his apparent lack of interest in human rights.40 The question confronting both sides is whether goodwill can help end conflicts, stabilize areas ravaged by war and Islamic State rule, or advance an effective counterterrorism agenda—or whether, absent President Obama’s restraints, America’s partners will intervene in ways that fragment an already polarized region even further. 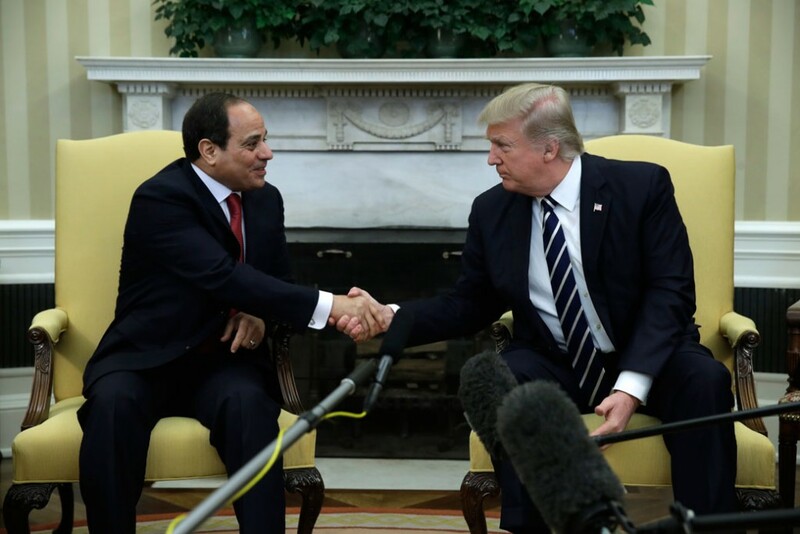 The warm words exchanged between Trump and Egyptian President Sisi have set the stage for a new opening.41 But significant work lays ahead to repair a broken U.S.-Egyptian relationship and deliver tangible benefits that can sustain the relationship over time. Otherwise, a friendly photo opportunity for leaders risks atrophying into a missed opportunity for their countries. From security aid to Sinai strategy to countering extremist ideology, the administration has an opportunity to push to deepen counterterrorism cooperation while resisting draconian overreach.42 Reports of quiet White House intervention to encourage the release of Egyptian-American aid worker Aya Hijazi, if accurate, are encouraging but must be built upon.43 The Trump administration has so far held off on an ill-considered, overly broad, and politicized designation of the Muslim Brotherhood as a terrorist organization under U.S. law. Improved technical cooperation would do far more to help Egypt fight terrorism. Trump and his team have said little on Libya. The international context, however, is shifting in ways that may encourage the administration to undercut power-sharing diplomacy in favor of the country’s would-be strongman, the controversial General Khalifa Haftar.44 Russia’s newly assertive support for Haftar, its deployment of forces into Egypt, and the Trump administration’s warmer ties with Haftar’s Arab champions, focus on counterterrorism over conflict resolution, hostility to power-sharing with Islamists, and sympathy for autocrats all suggest the prospect of a shift in U.S. policy.45 Championing one party in Libya’s civil war risks deepening Libya’s conflict and collapse. President Trump, like his predecessor, must contend with Turkey’s descent into authoritarianism and deep-rooted differences over the anti-Islamic State campaign. Trump’s reported decision to follow President Obama’s path and support the Kurdish-led coalition most prepared to retake Raqqa risks Turkish blowback.46 Trump’s congratulatory call after a referendum that will eviscerate Turkish democracy may ingratiate him to Turkish President Recep Tayyip Erdoğan, who praised Trump’s strongman-style rhetorical assault on U.S. press freedoms.47 But praising the dismantling of Turkish democracy represents a troubling departure. Erdoğan’s consolidation of power at the expense of Turkish institutions hurts U.S. interests, as does Trump’s cynical response. Still, the combination of volatile personalities and conflicting national interests involved suggest a rocky path ahead. President Trump’s Middle East policy offers short-term fixes to generational challenges. When it comes to enduring drivers of instability, Trump has offered no vision, no plans, and little interest. Better relations with rulers may be short lived. And in the Middle East, reality has a way of intruding. Before too long, significant course corrections will be required to address the problems Trump so far has ignored. The first 100 days of the Trump administration featured significant, substantive causes for concern, above all the alarming combination of escalating militarism and diminished diplomacy.50 But some of the worst fears arising from Trump’s rhetoric have yet to materialize, offering reason for cautious hope that Trump’s experienced national security aides may yet prove able to mitigate his worst shortcomings. A pragmatic path exists if Trump’s team can summon the president’s better judgment to take it. But after 100 days in office, the greatest question mark injecting volatility into the system remains Donald Trump himself: an American president who approaches Middle East policy almost completely without empirical curiosity, deep convictions, or previously held positions arrived at through sustained reflection. Such an unmoored approach may create freedom of maneuver, and indeed, Trump brags about not telegraphing his approach. But Trump’s style brings far greater dangers arising from lurching inconsistency; severe mismanagement of America’s national security institutions and workforce, as well as his own team; disinterest in running an orderly process of deliberation and decision-making; and self-defeating policies and rhetoric. From Iranian theocrats less threatened by the appeal of American democracy now tarnished by association with Trump, to wary U.S. partners no longer sure of the value of American commitments, to the risk of a hollowed-out civilian capacity, the costs of Trump’s presidency are broad, unpredictable, and likely to outlive his tenure. One lesson of Trump’s early days is that, for better or worse, the Middle East still looks to the United States for leadership but will not stand still to await a coherent strategy from President Trump.51 Trump has made clear that “if the world changes, I go the same way.”52 Despite the hole he has already dug, Trump retains meaningful opportunities to advance U.S. interests in the Middle East—but only if he uses the 100-day milestone to reassess his approach and consider carefully what has worked and what has not. Daniel Benaim is a Senior Fellow at the Center for American Progress, where he researches U.S. policy in the Middle East, as well as a visiting assistant professor at New York University. He previously served as a Middle East adviser to Vice President Joseph Biden and a member of Secretary of State Hillary Clinton’s policy planning staff.